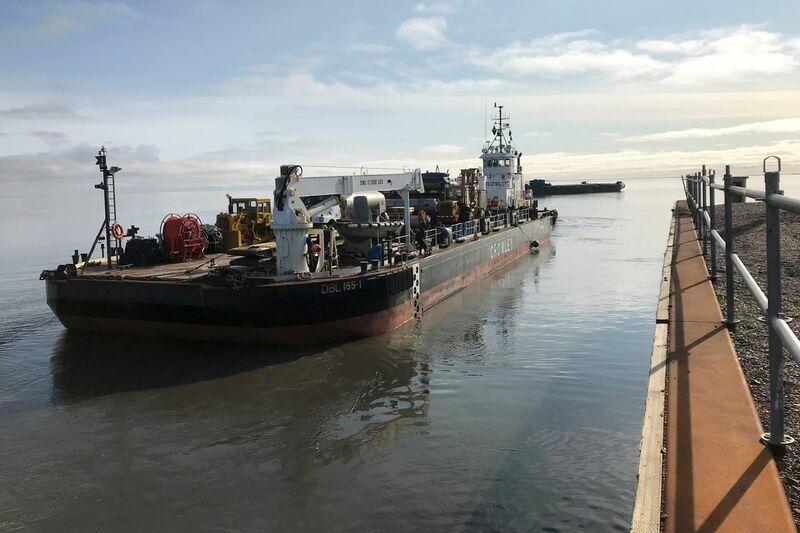 For the first time in decades, a transportation company delivered a bulk shipment of diesel fuel to the Prudhoe Bay oil fields by sea, reopening a route that could reduce the risk of dangerous fuel truck rollovers along Alaska highways. The unusual Aug. 30 barge delivery of 2 million gallons of fuel replaces 200 trips by truck, said Dave Pfeifer, president of Colville, the company that organized the marine delivery. "It's really about reducing the risk of road travel," Pfeifer said. The ocean delivery was tiny compared to the fuel trucked annually to the oil fields by Colville and other companies that haul it hundreds of miles after it's manufactured in Southcentral Alaska refineries. But any reduction in the tanker-trucks will improve highway safety, said Vince Kelly, who retired from the state Department of Environmental Conservation in 2013, where he worked on marine spill prevention and response. "Everything counts, so this is absolutely a good thing," said Kelly, a member of Prince William Soundkeeper, who has tried to raise awareness about the dangers the rollovers pose to the environment. "In my opinion there is less chance of a major spill from a barge than there is from trucks, and I think the record bears that out," he said. The barge shipment won't happen again this summer because Arctic sea ice will close in, Pfeifer said. The idea for the fuel haul originated in 2015. That year, unprecedented spring melting plus flooding from the ice-choked Sagavanirktok River washed away swaths of the Dalton Highway, the so-called Haul Road to the oil fields. That closed off the road for more than two weeks. Industry fuel supplies dwindled. "It almost shut down the North Slope because there was no fuel," Pfeifer said. "They were flying it in. It was kind of a crisis." So Colville built large storage tanks to take a sea shipment, a project that cost millions of dollars, said Pfeifer, who declined to provide specific figures. The industry will now have a back-up source for the diesel fuel — at least in summer when barge deliveries occur — if fuel trucks are halted again in the future, he said. Pfeifer said there's growing demand for diesel fuel on the Slope, as companies ramp up drilling and other activity amid higher oil prices. "This is certainly a big achievement by Colville," said Walt Tague, director of commercial operations at Crowley Fuel, which hauled the fuel for the company. It's the first marine shipment of fuel to Prudhoe Bay since the 1990s, said Alex Sweeney, a retired Crowley executive. Crowley had made those summer deliveries since the 1970s, storing the fuel in barges on the water and sending it to shore in smaller vessels. That ended after the 1989 Exxon Valdez oil spill in Prince William Sound, when oil companies backed off using the single-hulled fuel barges of the time, Sweeney said. A new law put in place after the spill called for phasing out the barges and replacing them with double-hulled vessels less likely to spill fuel. The recent delivery used double-hulled barges, said Sweeney. The delivery was "incident-free" and safe, said Pfeifer. Colville is making plans for another barge delivery next summer. Retreating sea ice is allowing more time for the summer shipments, he said. Colville will continue to deliver most of its fuel by truck. Like other companies hauling fuel, Colville has suffered rollovers, especially during poor road and weather conditions. Reports of serious injury are rare. But the company recently lost driver Joy Wiebe, 50, the only woman hauling fuel tanker to the oil fields. She died last month after the tractor she drove went off a soft shoulder and down a steep embankment, Colville said. That was an unfortunate, tragic accident, Pfeifer said.